Overall, the anime was awesome. From the very beginning that Kiba stumbled into town to the very end of the anime when-I loved it all. The presentation of the anie is very nicely done, and you really sympathize with the characters as they go along their journey to Paradise. Quite njoyable, I also like the lessons the show gives us (won't say anything) rather than just the mindless watching. What I also love about this anime is the Russian. I've seen it quite a few times, from signs to books to maps. I was a little surprised to see Russian too, because I'm used to seeing Japanese kanji and things taking place in Japan. This was definetely a nice twist to the whole thing, and I think artists should try to incorporate other languages in their anime like this one has done. A great series, with a complicated, sad, and somewhat confusing ending and ideology. I grew to loved each character, and watching the ending of the series unfold; I was invested and heartbroken. One thing I loved about the series as well was the quality of the music that it used; Yoko Kanno does an excellent job on this soundtrack, and it supports the 'gravity' and weight of the series well. La verdad me gusto la serie, algo diferente a lo ya acostumbrado regularmente a verse, si tanto spoiler solo digo que una buena serie se guia de una buena historia, y esta la tiene. A fine statement about distopia, memory and postmodernism. (My god!!! Don't make me start on Kanno-sensei's magic *¬*!!!) Although the manga and the anime differ in lots of detail (narrativewise), the final message is powerful in both (In my opinion is better to have seen the anime first and then to read the manga. Otherwise is heart torning...D:) When the time seems at its end, is only natural to return to the beginning, to the roots: in a distant future where existance has no meaning or porpuse but to perpetuating itself, old believes and perspectives come forth. It's not gratuitous that the main characters were wolves; amidst cold technology and humans with no self-consciousness they are the only voilce that make sense, they represent the natural truth of movement and change. I loved the story. These wolves that hides behind the appearance of humans. They’re search for the rakuen, their paradise. The moon flower that can guide you to paradise, that also has the appearance of a young lady. Really really great story, great character designer. I saw this long time ago, but I’ll soon rewatch it. Sure this is something special. I have a sad feeling in my heart after finishing it, guess every journey has eventually meets its end. But this one was told just perfectly from the very beginning to the end. Many things had happened, many feelings flowed, courage was showed, tears and blood were shed. This anime has its own soul, own world. What I experienced was just... beutiful and unexpected. Really love it, can recommend to everyone. To speak the truth I think we all should watch more stories like this, so we can be better people. Two things come to my mind watching it: first Metal Gear Solid (Alaska, guns, Sniper Wolf, cheerless colours) and Final Fantasy VII (journey and... don't know why exactly^_^). Oh yeah, almoust forgot to pick up a fav char^_^ Tsume is the one, but everyone has his important role here, the plot is showing it awesomly! Good anime, original plot and very good quality of animation as expected of Studio BONES. I have seen only half of it, because I haven't got enough time (school, hope U understend ^_^), but still I enjoyed it. And also, I like wolves ^_^, so I couldn't stop myself from watching it. This was my very first mature anime. (with like, blood and swearing and stuff) Not currently watching it, where I've finnished it. But it was such a great series, I remember being glued to it! So much drama and action....oh man, just so awesome. Makes me laugh and cry everytime I rewatch it. It deffinately desserves more attention. So people! If you love wolves, go watch it! Right now! You won't be disappointed! Come on, it's in english too! I really enjoy watching Wolf's Rain. Although short, this series meant a lot to me. I've seen all the episodes including the OVA (to which I own) which sent me to tears. With a variety of different characters and in different settings, Wolf's Rain gives us an idea on how it could parallel ours. In the sense, if we were searching for a 'Paradise' it would be a perfect world compared to the state how we live in now. It touches on how things can be lost within an instant and never regained back. Found this video to be uniformly and almost completely to be of a sad and depressing nature. I personally didn't enjoy it. It seemed to be a more 'sad' version of 'Eureka 7' with something of a similar story line (though this one was much shorter and more direct). The effects were nothing to write about. It was interesting to hear the same voice actor that played the captain of 'good ship' (sorry not that good with names when have only seen things once or twice) in Eureka Seven, as well as an earlier incarnation of Ichigo from Bleach playing the lead. 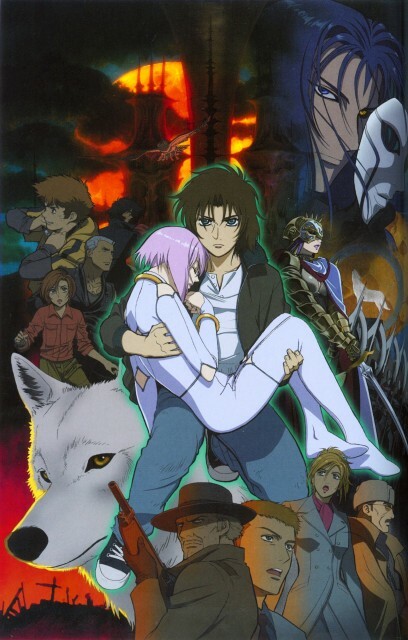 But the flower girl in Wolf's rain was a direct correlation to the scub-coral girl, Eureka, with the head-wolf char's intent to go off and live with her after the end of the earth a corollary to Benton going to live with Eureka, but the story in Eureka though it could be seen, externally by humans, to have ended the existence (ended in death) of the primary character (Benton), it was seen by viewers as him having entered in with the Scub Coral and living on with them. Similarly, though the story in Wolf's Rain chose to kill off everyone by the end, they could have, at least, had the lead char merging in a dream sequence into the stream of consciousness/unconsciousness that was 'eternity' where he would live in paradise with his beloved -- and eventually (as he was) be reborn into today's world. Just a choice of the story writer to go with 'negative' emotions -- in a way that _I_, personally didn't like. If I want such negativity, I can just turn on today's news. Why turn to anime for depressing content?